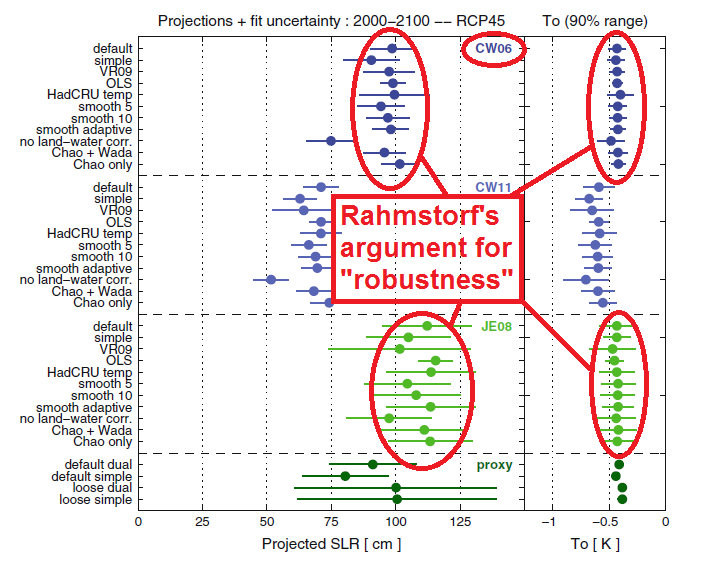 Rahmstorf (2011): Robust or Just Busted (Part 7): The Irony of Jevrejeva’s Data. 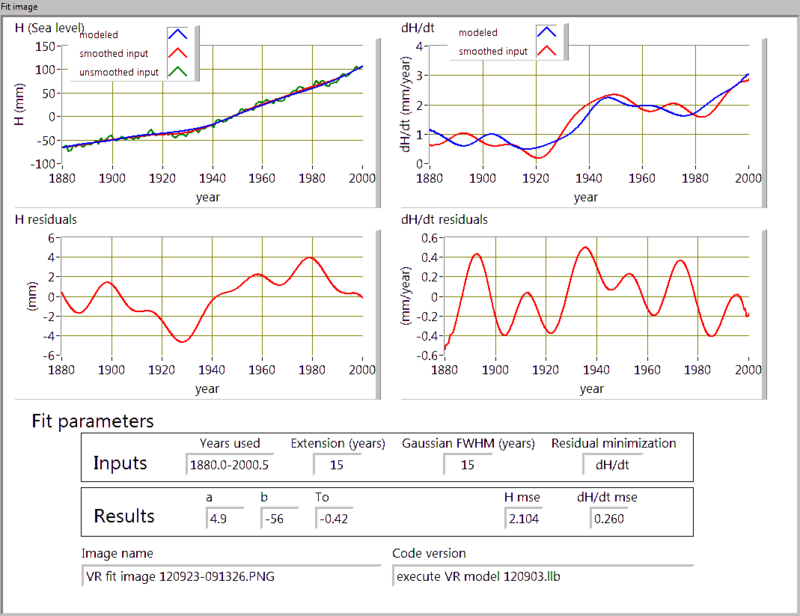 This is part 7 of a multi-part series about “Testing the robustness of semi-empirical sea level projections,” Rahmstorf, et. al., Climate Dynamics, 2011. You can see an index of all parts here. I frequently refer to this paper as R2011. 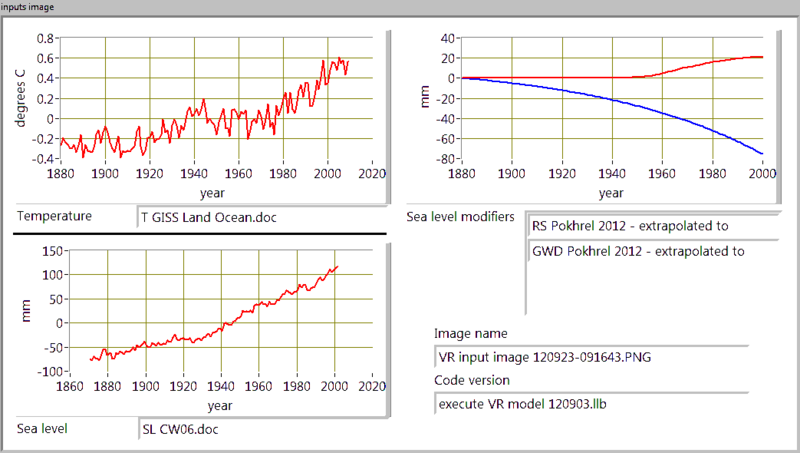 Let’s talk a little more about the irony of using the Jevrejeva’s 2008 sea level data, which I will refer to as JE08, to confirm Rahmstorf’s sea level projections for the 21st century. 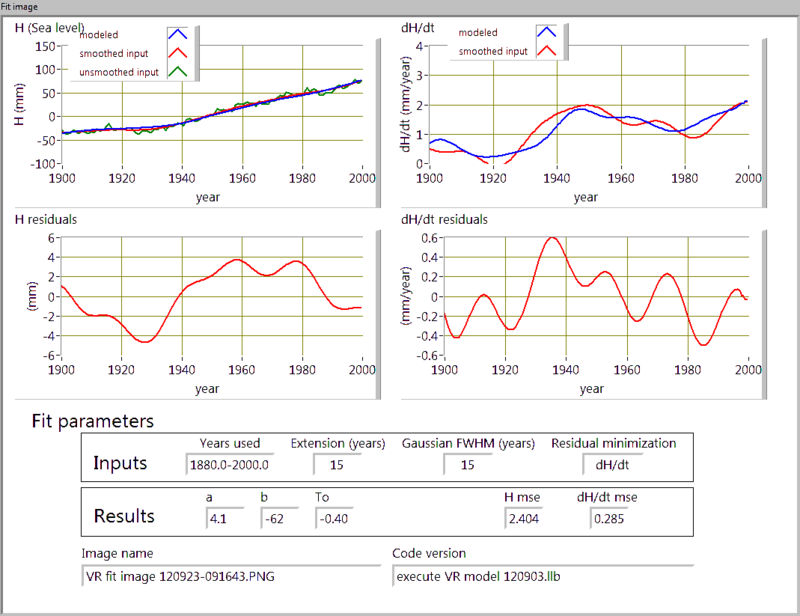 As I have already explained, Rahmstorf claims in his 2011 paper (which I will refer to as R2011), that his model is “robust,” meaning that variations of historical 20th century input sea level data yield essentially the same sea level rise projections for the 21st century. 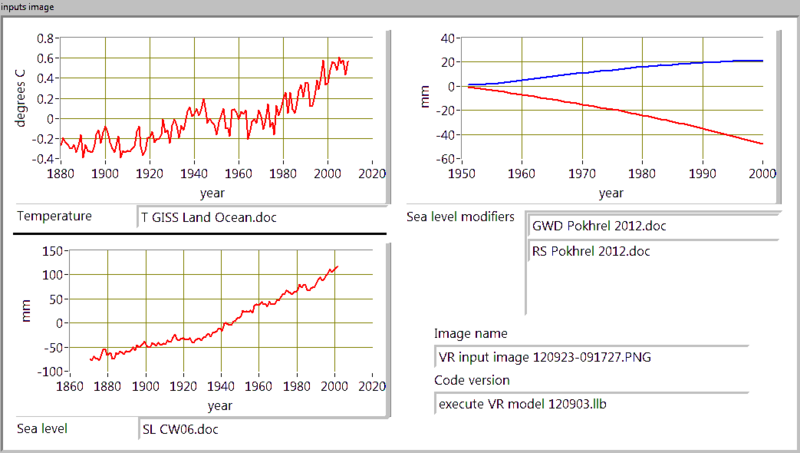 R2011 graphically presents seven sources of sea level data (while ignoring others) and implies their similarity by overlaying the same quadratic fit for all of them. 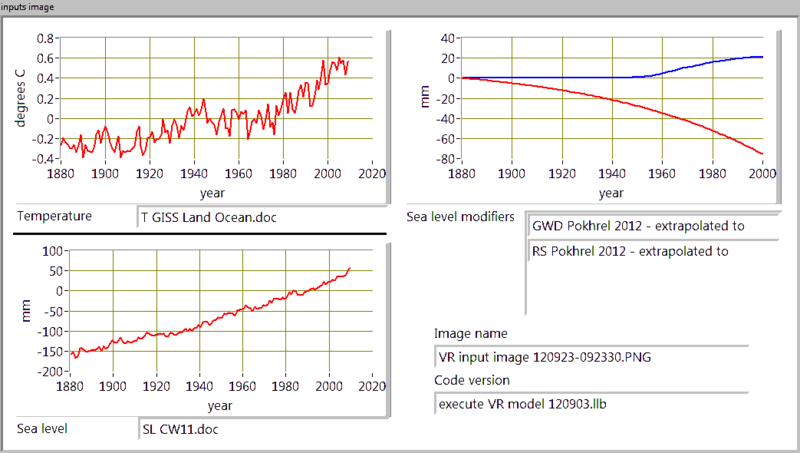 R2011 leads us to believe that the model is robust with, specifically, the input of these various sea level data sets. 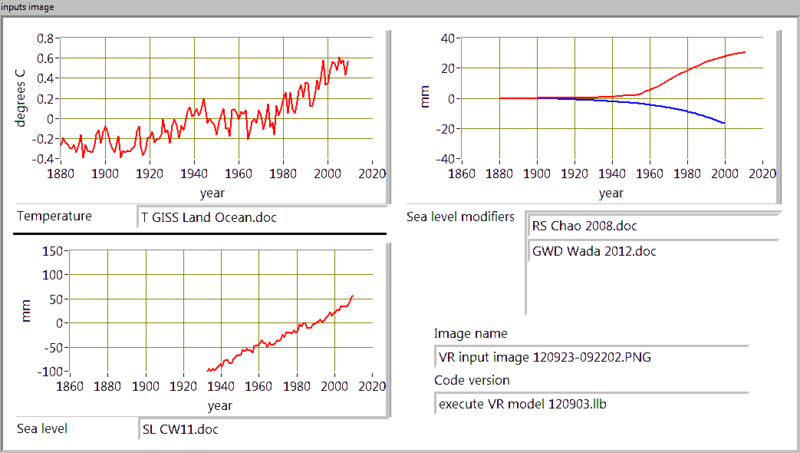 R2011 presents the results of the model using only three of the seven sea level rise inputs. Two of the three are by the same authors, Church and White, who clearly believe their later version of the sea level data (CW11) is an improvement over their earlier version (CW06). Then, R2011 cynically rejects the model results from Church’s and White’s better set of data because those results testify against R2011’s desired conclusion of extremely high sea level rises for the 21st century. The third data set that R2011 used is Jevrejeva’s. So after all the blathering about the “robustness” of their model under a broad variety of inputs, R2011 is left with just two sea level data sets that they are satisfied with: Church’s and White’s earlier data set, CW06; and Jevrejeva’s 2008 data, JE08. Figure 1, below shows R2011’s figures 1 and 9, with my annotation. Figure 1. R2011’s figures 1 & 9 showing Rahmstorf’s judgement about the quality of sea level sets. Keep in mind that R2011’s objective in their claim of robustness was to prove that their earlier results , based on the CW06 were realistic. So, in effect, after all the hand waving JE08 is the only one of the seven sea level data sources that fulfills that purpose. That is why we are taking a little closer look at JE08. Let’s start by looking at an overlay of JE08, CW06 and CW11 in figure 2. 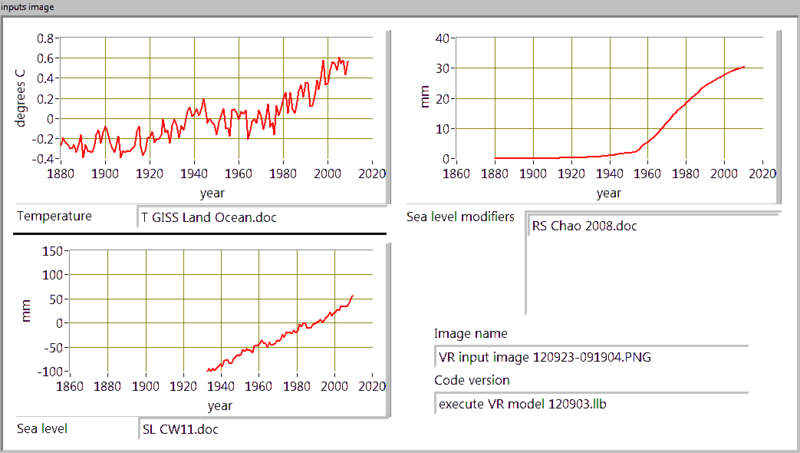 If Rahmstorf’s model were “robust,” as R2011 claims, then all three of these data sets as input to the model should yield very similar sea level rise projections for the 21st century. But one of them yields much lower results than the other two. The amazing thing is that the outlier is CW11, which is nearly a twin to CW06, at least compared to JE08. How can that be? Let’s suspend our higher cognitive functions for the moment and agree with R2011’s reasoning. That is, we will agree that the sea level rise projections for the 21st century based on CW11 input data must be rejected because they are much lower than the projections based on CW06 input data. 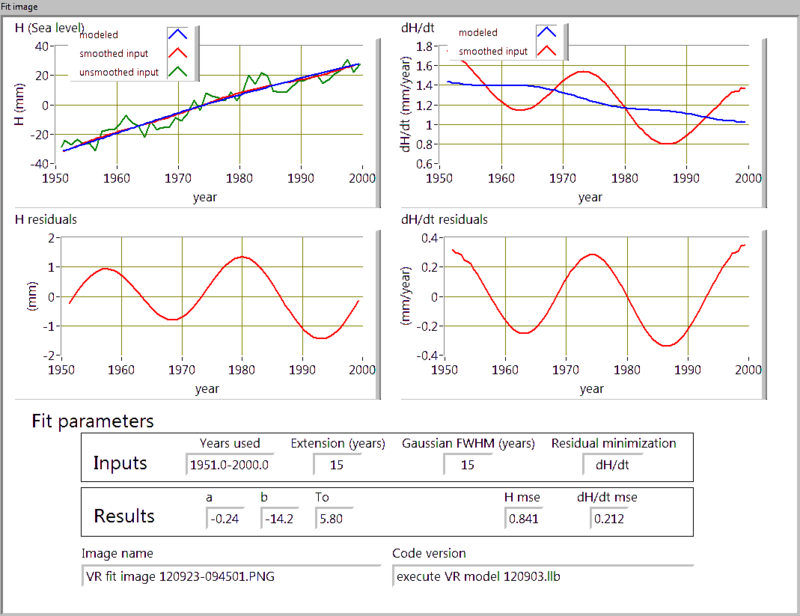 Inversely, we will agree that sea level rise projections for the 20th century based on JE08 input data must be accepted because they give high 21st century projections, just like the projections based on CW06 input data. Since we have decided to mindlessly accept the usefulness of JE08 to back up Rahmstorf’s high sea level rise projections for the 21st century, then we should also accept some other interesting features of JE08. So let’s take a closer look. It is quite striking that according to JE08 and the satellite data that the sea level rise rate for the middle third of the 20th century (1933 to 1966) is exactly the same as the sea level rise rate at the end of the 20th century and beginning of the 21st century. How can this possibly be!? How can this data that indicates no increase in the sea level rise rate for 80 years cause tremendous increases in the sea level rise rate for the 21st century when used as input to Rahmstorf’s model? Consider Stefan Rahmstorf the Dart Thrower. He holds forth at the pub as the best thrower in the kingdom. He brags about his precision, claiming “I can hit high numbers every time! My talent is robust!” Challenged by another annoyed pub patron to “put up or shut up,” Stefan grabs a handful of darts and goes to work. He throws seven, but only three hit the board. Two are on high numbers and one is on a low number, the rest are stuck in the wall. “See!” he says triumphantly, pointing at the two darts on the high numbers. The other patron points out the projectiles stuck in the wall. “Bad darts” Stefan replies. 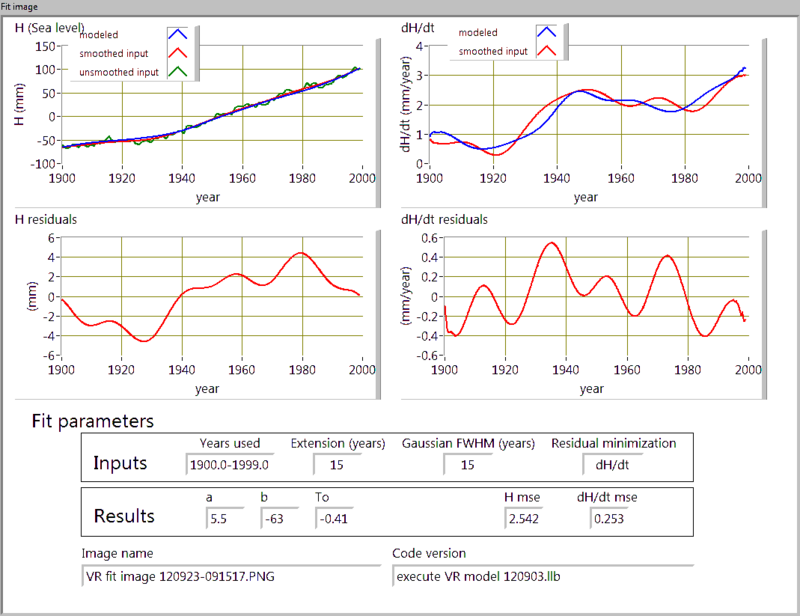 This is part 5 of a multi-part series about “Testing the robustness of semi-empirical sea level projections,” Rahmstorf, et. al., Climate Dynamics, 2011. You can see an index of all parts here. I frequently refer to this paper as R2011. What does Rahmstorf mean when he says his model linking sea level to temperature is “robust?” Simply this: when the inputs that he deems acceptable are inserted into his model, he gets the results he likes. How does he decide which inputs are acceptable? Easy – if they yield the results he likes, then they are acceptable. It is a very simple and efficient system of logic! Rahmstorf and his associates have a pressing need to defend their sea level rise projections. I have presented a host of reasons why his model is bogus. One of the most embarrassing is that one of his fit parameters, that he expected to be positive, is in fact negative for every combination of input tried. This leads to all kinds of bizarre results (see here, here and here , for example). The other is that his sea level projections dropped dramatically when his preferred source of 20th century historical input data updated their data set. This “robustness” paper (R2011) is a stumbling attempt to dismiss the revised sea level data from the source that he had previously enthusiastically used. where H is sea level and T is temperature. Insert historical data for H and T, and solve to a, b, and To. Then insert projected temperatures for the 21st century and calculate projected sea level rises for the 21st century. The VR2009 model and approach have an amazing number of problems and the list just keeps getting longer. There is a whole family of realistic temperature scenarios for the 21st century that cause this model to yield ridiculous results (see here). 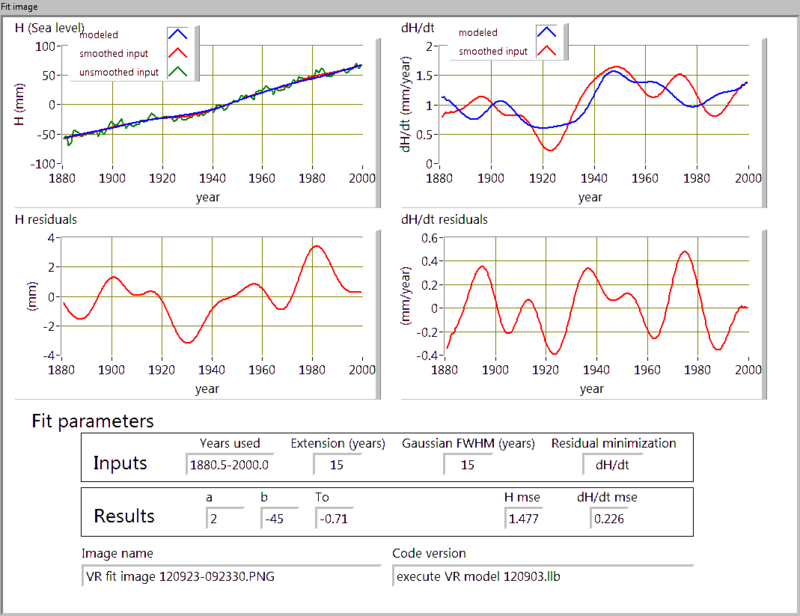 The root of most of these problems comes from the fact that every set of historical sea level inputs and temperatures that Rahmstorf and associates have tried result in a negative b. 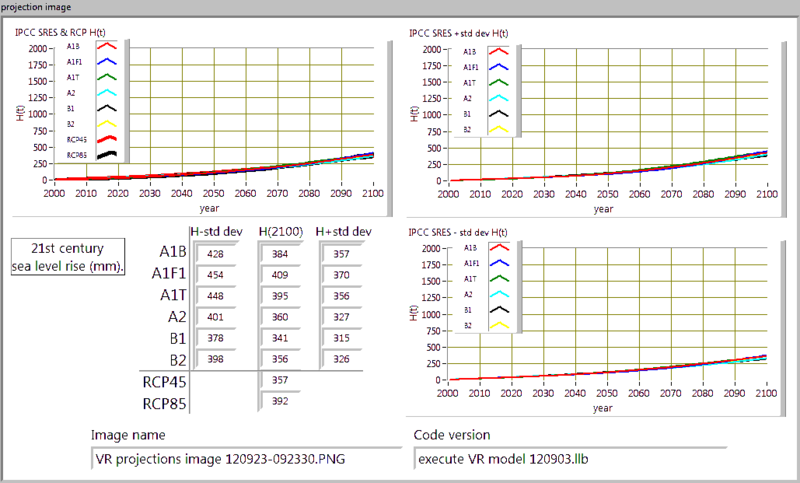 That includes every set of input data considered in R2011 (see figure 1, below). FIGURE 1. 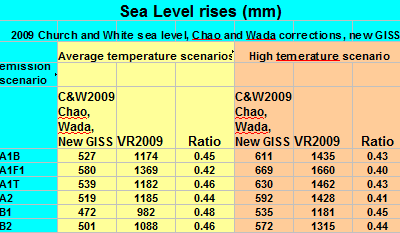 R2011’s projections of 21st century sea level rise and baseline temperatures under the RCP45 emissions senario (Moss, 2010) for various temperature and sea level input data sets. I have circled the results R2011 likes. 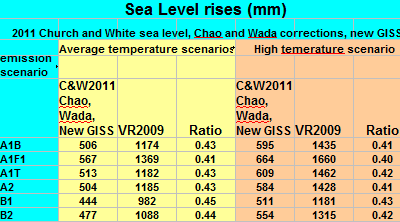 As you can see, nothing involving the Church’s and White’s 2011 sea level data (CW11) meets R2011’s quality standard. 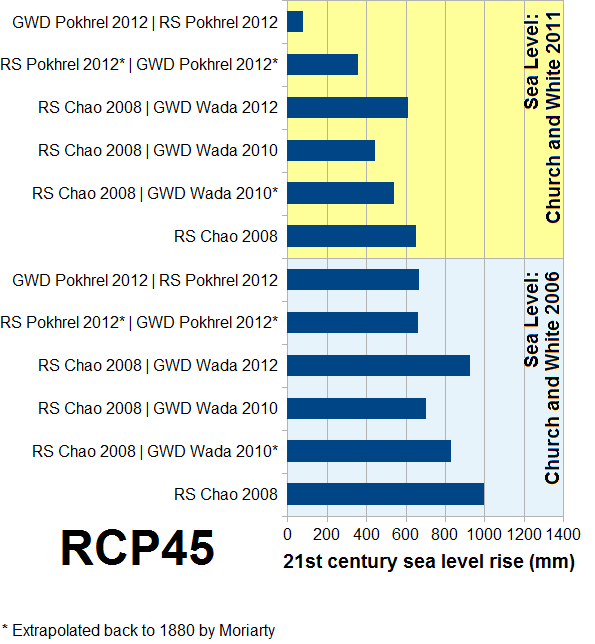 R2011 has determined that Church’s and White’s 2006 sea level data (CW06) is better than Church’s and White’s 2011 data, despite the fact that Church and White obviously think their updated 2011 data is better. Why does R2011 think the 2006 sea level data is better than the improved 2011 sea level data? 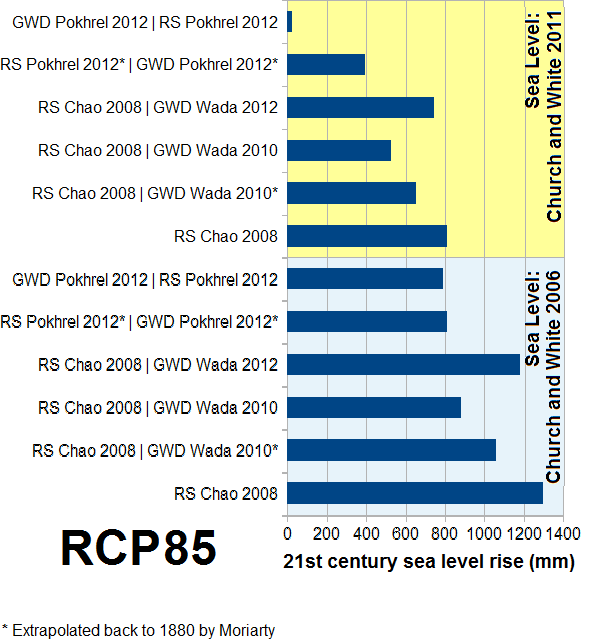 Well, I have already explained that – the 2006 Church and White sea level data gives the results that R2011 wants – higher sea level rise projections for the 21st century! But they can’t really say that. Instead they say that the 2011 Church and White data leads to a baseline temperature, To, that they insist is too low. To is the steady-state temperature deviation from the 1950-1980 average temperature at which Rahmstorf’s model says the sea level would be unchanging. Look at the right side of figure 1. 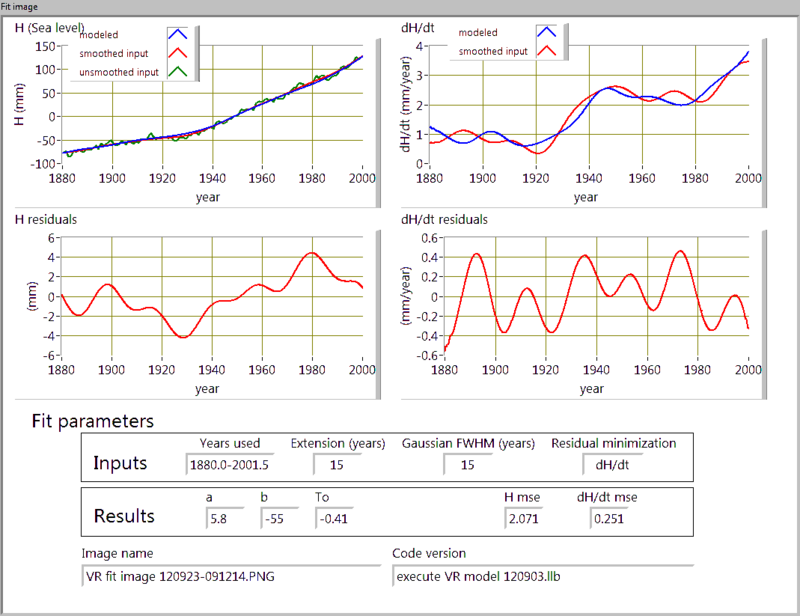 It shows the baseline temperature that R2011 derived with the various sets of input data. 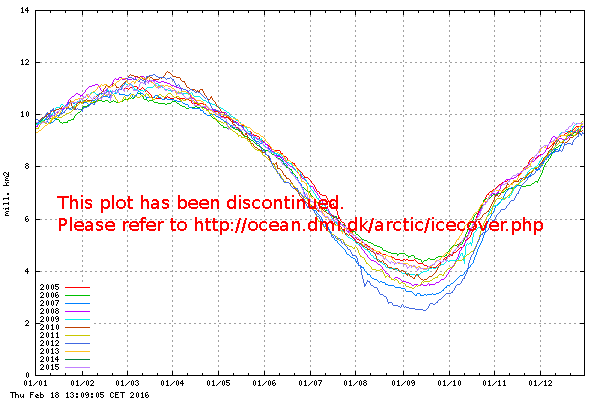 The values of To that meet with R2011’s approval average out to about -0.43 degrees. But those based on CW11 average out to about -0.62 degrees C. A difference of less than two tenths of a degree. If you were to ask the authors of R2011 what other evidence do they have that To must be about -0.43 degrees, they will refer you to “Climate related sea-level variations over the past two millennia,” which used evidence from two salt marshes in North Carolina to corroborate this global value. And they have great confidence in this independent confirmation (because two out of three of the R2011 authors were also authors on this paper). Hmmm. I will have more to say about R2011’s preference for To in a later post. R2011 implies that it has tried some vast universe of input sea level and temperature data combinations in their model. They say “We then compare projections of all these different model versions (over 30)…” Wow! Count them – over 30! But there are many more possible combinations than that. R2011 has picked a few cherries from a very prolific tree. 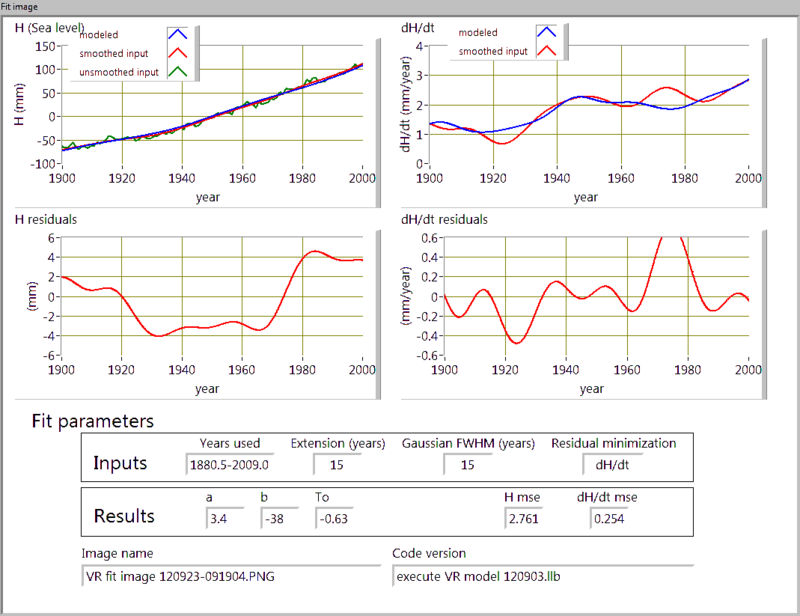 In figures 2 and 3, below, I have run several temperature and sea level input data sets in my implementation of Rahmstorf’s model. In some cases my input combinations are the same as some found in figure 1. In some cases they are different. 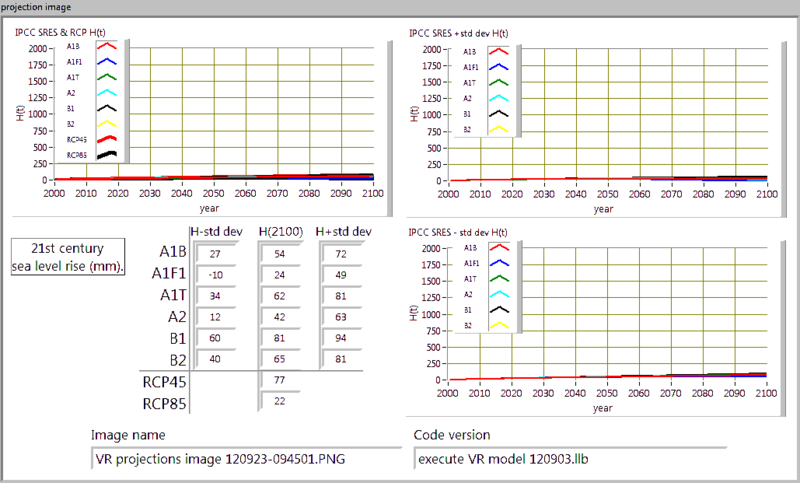 I have arranged the input combinations in chronological order, with older versions of input data on the bottom. Notice a trend? Figure 2 and figure 3 give projections based on the RCP45 and RCP85 emission scenarios, respectively. FIGURE 2. Sea level rise projections for the 21st century based on my implementation of Rahmstorf’s model under the RCP45 emissions scenario (Moss, 2010) for various temperature and sea level input data sets. FIGURE 3. 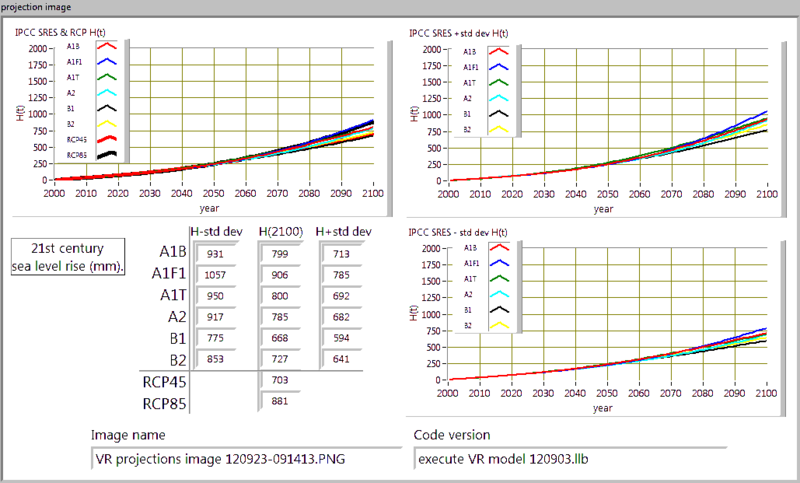 Sea level rise projections for the 21st century based on my implementation of Rahmstorf’s model under the RCP85 emissions scenario (Moss, 2010) for various temperature and sea level input data sets. 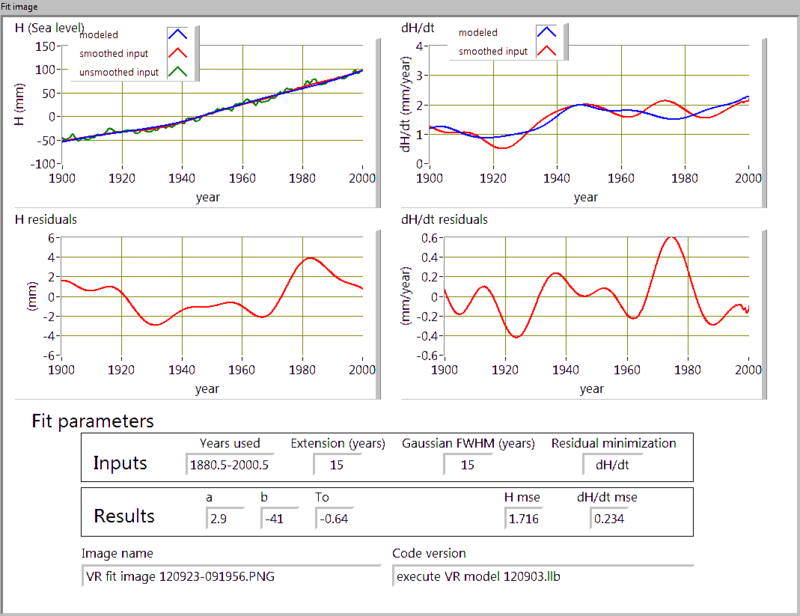 As you can see, newer sea level data (whether it is actually sea level (CW06 vs CH11, or reservoir storage (RS) or ground water depletion (GWD) modifiers) tends to lead to lower 21st century projections when inserted into Rahmstorf’s model. Which projection do I endorse? None of them. 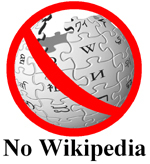 Make no mistake – the Rahmstorf model is bogus, no matter what the inputs are. I am just playing games with it. The Rahmstorf model is an illusion that hooks you with a simple truth: It is a pretty good bet that higher temperatures lead to higher sea levels. 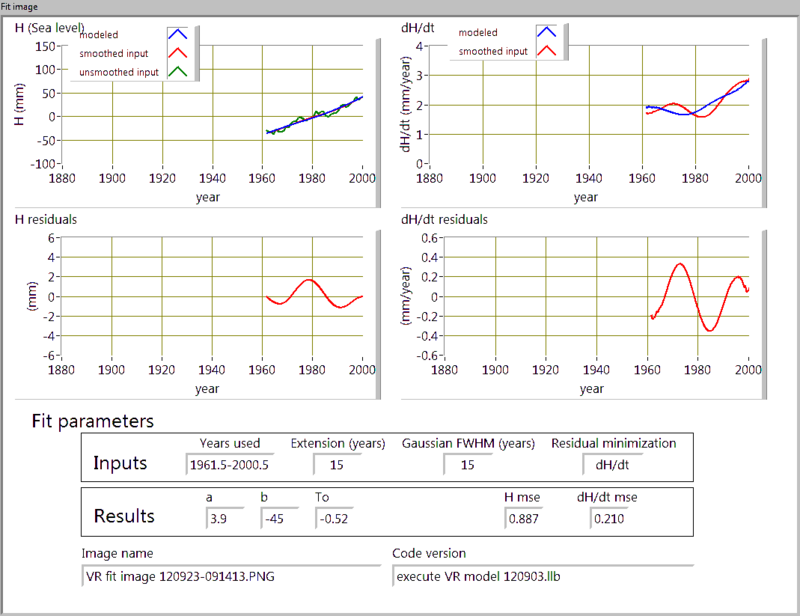 But the Rahmstorf model is not much better than a Ouija board for quantifying how much. There is much to be said about the results in figures 2 and 3. The 48 files below give the long story that is summarized in figures 2 and 3. In one of the many interesting chapters of Thinking, Fast and Slow, Daniel Kahneman, Princeton University Emeritus Professor of Psychology and winner of the 2002 Nobel Prize in Economics discussed Daniel Bernoulli’s 250-year-old mathematical theory of risk aversion. “All this is rather obvious, isn’t it? One could easily imagine Bernoulli himself constructing similar examples and developing a more complex theory to accommodate them; for some reason, he did not. One could imagine colleagues of his time disagreeing with him, or later scholars objecting as they read his essay; for some reason, they did not either. What does all this have to do with ClimateSanity? 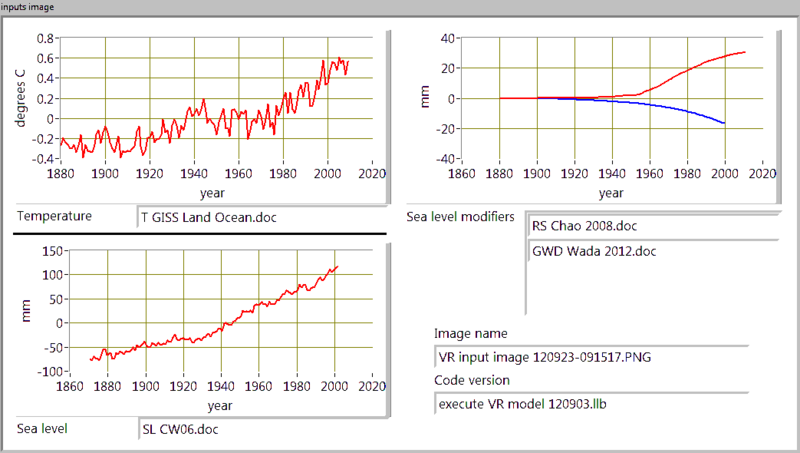 Simple – it sounds like Vermeer’s and Rahmstorf’s model linking global sea level to global temperature (“Global sea level linked to global temperature,” Proceedings of the National Academy of Science, December 22, 2009 vol. 106 no. 51 21527-21532 ). It has been incontrovertibly demolished, but the believer’s just can’t let it go. They must suffer theory-induced blindness. They seem to have endless capacity to simply overlook the plethora of bizarre, improbable or impossible consequences of the Vermeer and Rahmstorf model.